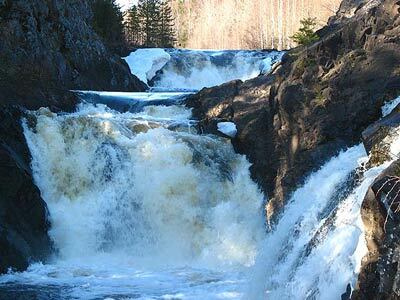 Kivatch Waterfalls is located on the Suna River, about 60 kilometres from Petrozavodsk. The height of the Waterfalls is 10.7 metres. 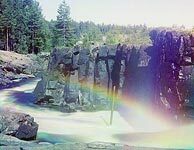 It is the second large of the plains waterfalls in Europe now. "The noise of water falling from Kivatch, has announced to us its affinity before, rather than we have approached. 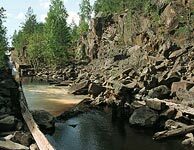 Here presented visually the stone decent rock across the river lying on which are three ledges, one above another. From the first two ledges water runs down by ruts, which located between the stones, and falls to the third ledge from which in great quantity it is overthrown to the deep which located below the threshold, where water falls and converts to the foam and produces from itself the abundant steam, which having risen upwards, falls on a trees growing near the shore and humidifies its branches to the tops, why in winter they stand to hang round with large icicles. 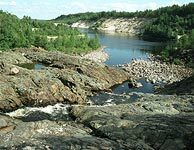 In spring high water falling happens here so strongly that the big logs, which have been fired from a threshold, break up in half or more." 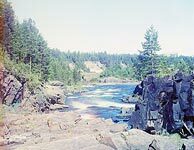 "At about 4 miles before entering Ussunskoe Lake, there are picturesque waterfalls Girvas and Por-Porog on the Suna river. 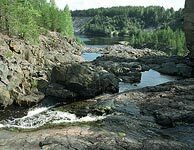 After leaving this lake it creates a well-known waterfall Kivatch, that was berhymed by Derzhavin. In 1858, when His Majesty Alexander Nickolaevitch visited Kivatch there was built a pavilion, which is still kept there. In spite of big fall the Suna is used for timber rafting. There is a wooden shoot built on Kivatch waterfall to let the timber over it. As all rivers of the Olonets region Suna is rich with water only during spring flood." 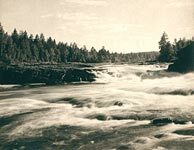 At the 1930-s, after considerable exporting of the waters supplying it for the needs of Kondopoga hydroelectric power station, Kivatch Waterfall appreciably has lost its former power. More large waterfalls on the Suna River – Girvas (height was 14.8 metres) and Por-Porog (height was 16.8 metres) – have finished the existence. See also Kivatch's old postcards.